I kept the designs quite simple and included the logo and name of the brand on the caps. 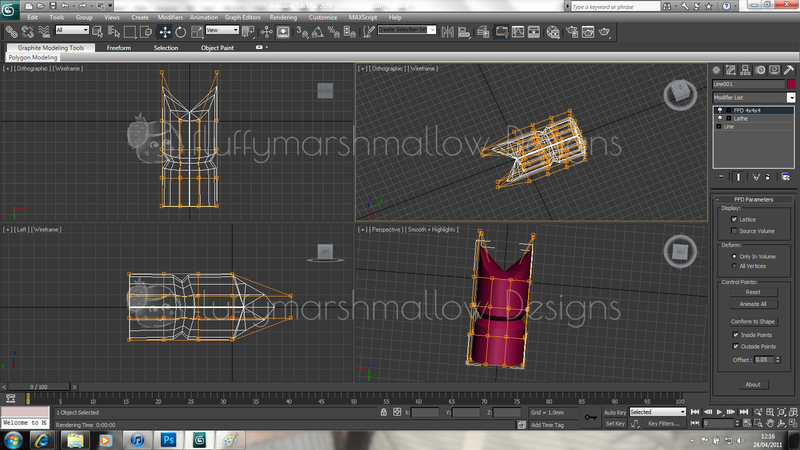 I first created the shape of the wine cap in 3DsMax. I used the line tool to create half the shape of the cap, moved the pivot point to the bottom corner of the drawing and then used the lathe modifier. This created a basic cylinder type shape. I added the FFD 4x4x4 modifier which allowed me to alter the shape of the top of the cap and create cat-like ears. 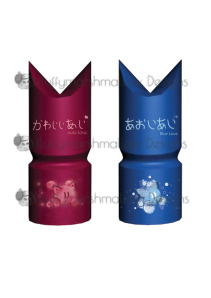 I made a pink cap and a blue cap for the two wine brands I designed. Finally, I rendered the object and saved the file as a JPEG to be used in Photoshop. I imported the JPEG files into Photoshop and added Kawaii Ai’s and Aoi Ai’s logo mascot on the bottom section of the cap. I then included the brand names on the top half, both hand-written using a graphics tablet. I thought this worked quite well and it is eye-catching to passers-by as it is unique and different. 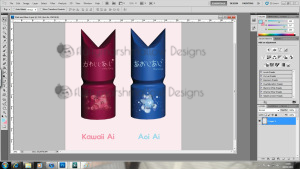 To finish off the presentation of the wine caps, I left the background slightly pink to relate to the cuteness of the wine brand. The caps are labelled below each design using ‘kronika’ font from DaFont. I’m quite happy with the end result ^^ I think they suit the nature of my brand of wine as they remain playful, cute and fun whilst being attractive to the viewer. 1. Removed some letters in the hair t keep the density lower. 2. Different opacity settings for the hair and lines on the face. 3. Re-did the eyes, nose, mouth, face. 5. 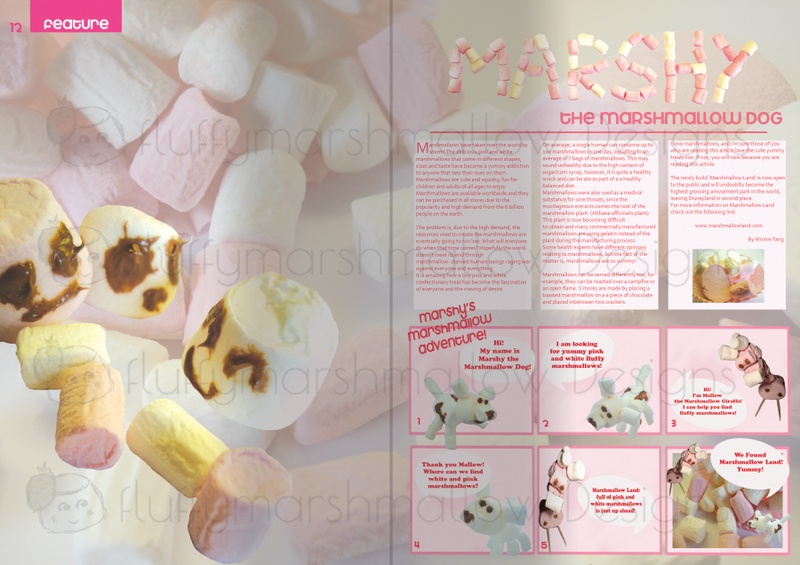 Added my logo ‘Mallow the Marshmallow’ and ‘Fluffy Marshmallow!’ text at the top. For research I looked at the different types of newspapers available. Each newspaper has its own style and colour choice. The articles included can relate to anything and I analysed how the text, images and overall presentation is presented out. 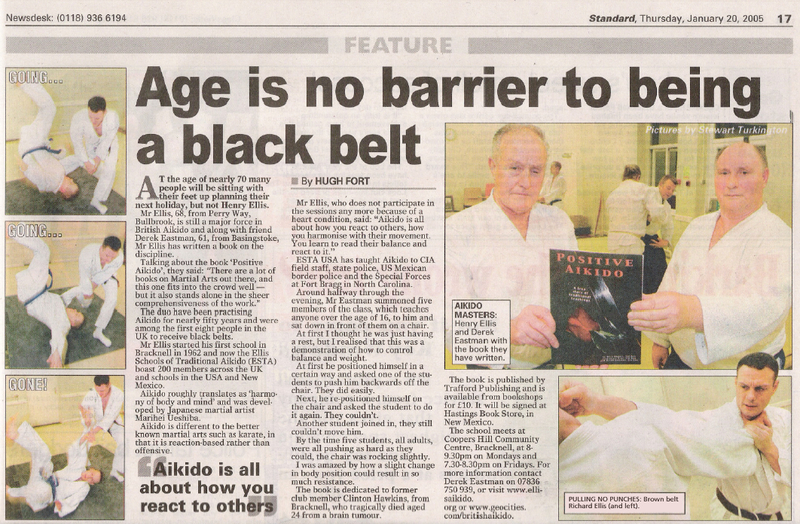 The main focus is the headline title which should catch the eye of the viewer and be seen first before looking at the main image and then the rest of the article. The more attractive/powerful/eye-catching title will draw the attention of the viewer and entice them to read the article. I quite like the idea of using images on the left hand side, I had thought about placing my comic strip similar to this layout. I didn’t like the presentation of the text, heading and images to the right. I thought it looked too crowed, so I wanted to try keep my design spaced out and easy on the eyes. I quite liked the layout of this newspaper spread, the title is the main focus, then your eyes follow down to the image of the gathering of people. The sub-headings catch your attention and the ad at the bottom works well. I like the structure. I wanted to make sure my spread would follow a similar example. I thought this piece had an overall best layout with a good hierarchy structure throughout. The background colour for the dog article draws the attention of the reader and all focus is aimed at there as it stands out from the rest. I was influenced by the structure of the text, font size and presentation. On deciding to look into creating a design layout for a magazine after analysing the hierarchy of type in newspapers, I researched on the internet for magazine spreads that I liked. 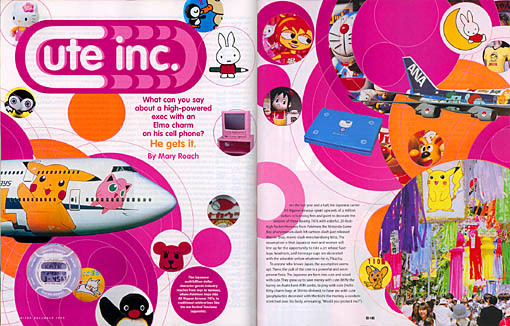 This is a Japanese magazine and as you can see it is very colourful, cute, fun and playful. 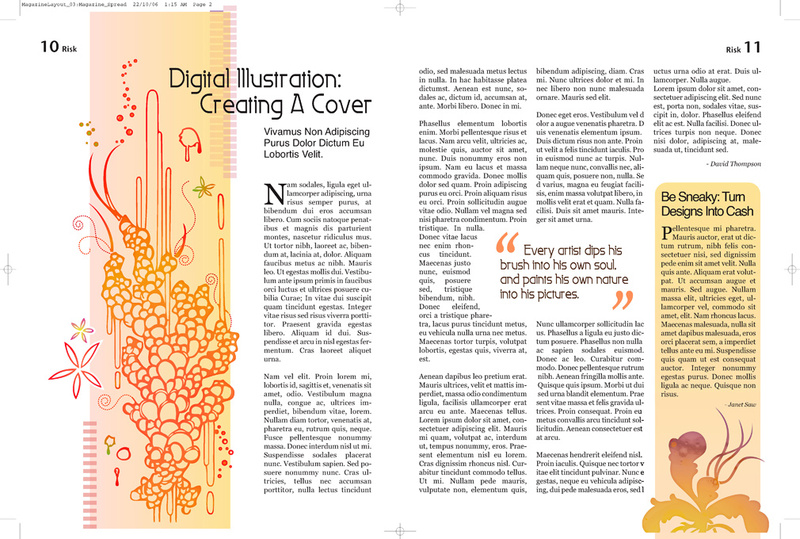 The spread is definitely attractive to the eye and it grabs the reader’s attention. I think the overall presentation works well and the text is a good size with appropriate colours. I like the way the images take up most of the spread and carefully placed, I was influenced by this particular spread with my final outcome design. This magazine spread takes the main image as priority and the headline title is secondary. 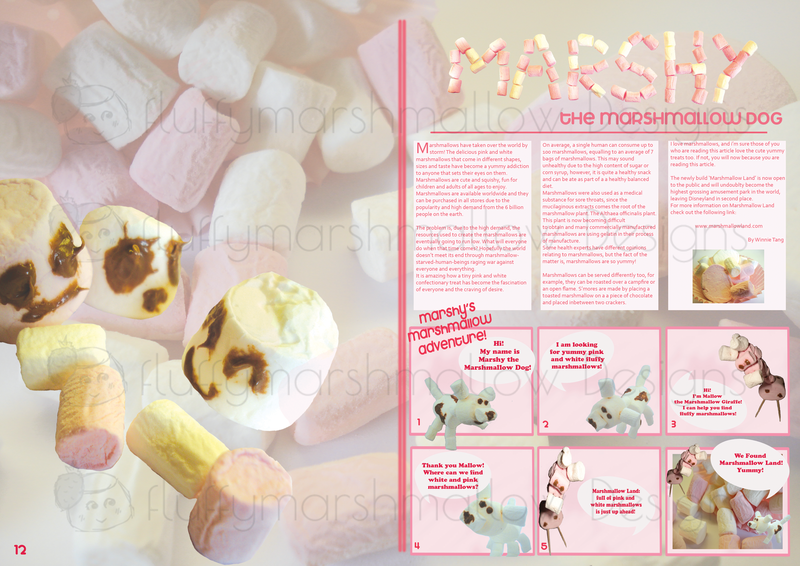 I liked the layout of the image so I decided to use a similar layout with the marshmallows. on the left side, but not leaking over to the right page as I had a lot of content to include (comic strip, text, images). 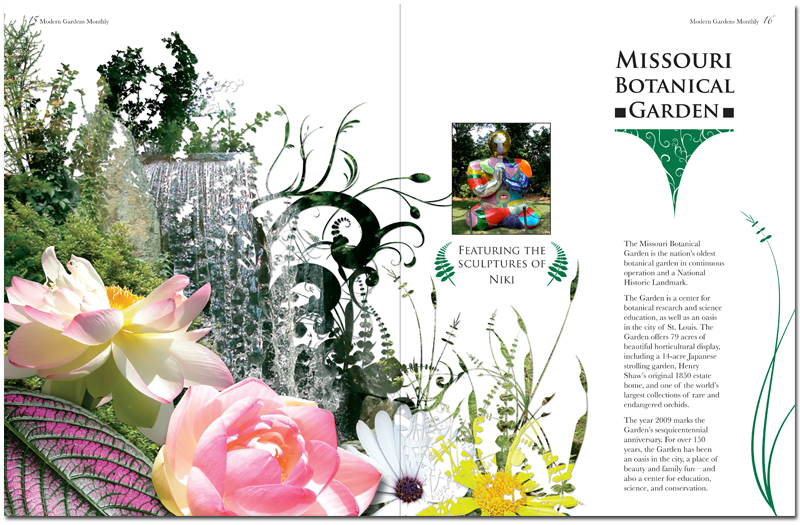 This spread is very clean-cut, I decided to keep my magazine spread simple and constrain the main text within boxes. However, for the comic strip, I decided is was best if part of the text and images were ‘hanging’ off the panels as it suited this type of content. The nature of a comic strip is fun and playful, this comic strip in particular is aimed mostly at children, so I think it was suitable. I prefer the paragraphing within this spread more so than figure 2a as it can make the text more easier to read and the flow is much better than having all the text squished together. All images taken from Google Images. 1. Take away the pink double lines in the middle and use the gradient tool to create the creased effect of a magazine opened. 2. Move the page number to the top left hand corner. 3. Include a tab coloured box on the top left hand corner beside the page number and include a description (feature). This helps make the design seem like a real magazine spread. Major Project Design – Check it out!